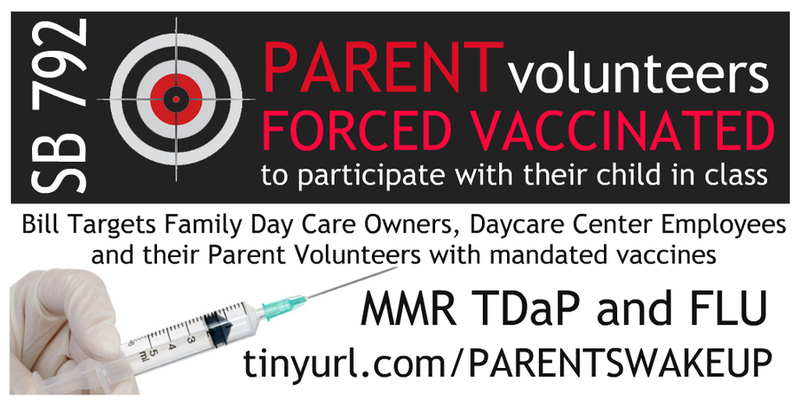 Vaccine Mandates for Adults who work or volunteer in day care, preschool and licensed family day care homes was passed in 2015 and became effective in September 2016. SB 792 requires adult vaccination for Measles, Pertussis and the Flu. There is a personal belief exemption (PBE) for the Flu vaccine. Proof of vaccination (childhood records) or titer test showing antibodies to measles and/or pertussis will eliminate requirements for more vaccines. Medical exemptions are allowed for all mandated vaccines. It is critical for adults to know that Measles and Pertussis vaccines are only administered in combination vaccines. There is not a “single antigen” vaccine for measles or pertussis licensed in the US. Technically it is not possible to comply with this overreaching and very poorly written law that added parent volunteers in the eleventh hour amendment. An adult would actually receive up to “seven” antigens; measles, mumps and rubella (MMR), and pertussis (DTaP, Tdap) which contains antigens for diphtheria, tetanus, and pertussis (whooping cough), plus the current flu vaccine which can contain numerous strains of flu. Most adults who have received a Tetanus shot have also been vaccinated for pertussis, although, it’s doubtful that they know it because this information is not widely known by the general public. Many tetanus vaccine providers do not give full disclosure including the vaccine manufacture package insert and the specific lot number for vaccines they administer. It’s important for adults to keep copies of vaccination records if they have received a tetanus shot during urgent or emergency medical treatment. The justification lawmakers used for passing SB 792 was based on the perceived health benefit for young children. In reality, placing young children in the care of recently vaccinated adults (or other children) increases their risk of contracting the very illness they're supposedly being protected from due to vaccine viral shedding and asymptomatic transition. Personal Belief Exemptions (PBE) are allowed for the flu vaccine. Childhood vaccination records or titer tests proving immunity for measles and/or pertussis eliminate the requirement to be vaccinated in order to work and earn a livelihood. Medical Exemptions are allowed for all mandated vaccines. Bill excerpt: This bill, commencing September 1, 2016, would prohibit a day care center or a family day care home from employing any person who has not been immunized in accordance with the schedule for routine adult immunizations, prescribed by the federal Centers for Disease Control and Prevention. The bill would specify circumstances under which a person would be exempt from the immunization requirement, based on medical safety and current immunity, as specified. The bill would make conforming changes to provisions that set forth qualifications for day care center teachers and applicants for licensure as a family day care center. Because the bill would extend the application of a crime under the act, the bill would impose a state-mandated local program. *limited exemptions: Section 41597.622. (a) Commencing September 1, 2016, a person shall not be employed at a family day care home if he or she has not been immunized according to the schedule for routine adult immunizations, as recommended by the federal Centers for Disease Control and Prevention’s Advisory Committee on Immunization Practices, with the exception of vaccination for human papillomavirus (HPV). SB792 (Mendoza) passed the Senate with 34 Ayes, 3 Noes and 2 abstaining votes. The bill was referred to Assembly Rules where it awaits Assembly Committee assignment for upcoming hearings. This bill restricts the opportunities for quality providers to remain in such a low paying and often unappreciated career. Before I could begin my very first job as a daycare teacher, I had to have 12 units of ECE coursework, CPR and first aid training, fingerprinting, and a TB test. I then earned minimum wage for the first two years of my employment. Adding the burden of undergoing a non-optional series of medical interventions in the form of mandated vaccines is not acceptable nor warranted.